We spoke about Rosie Mills Eckmire’s work, an artist whose studio was usefully positioned at Turf, where our feedback session was taking place — we all went downstairs and spent time in the space where Rosie makes work. Rosie showed us a wide selection of drawings, prints and tapestries. 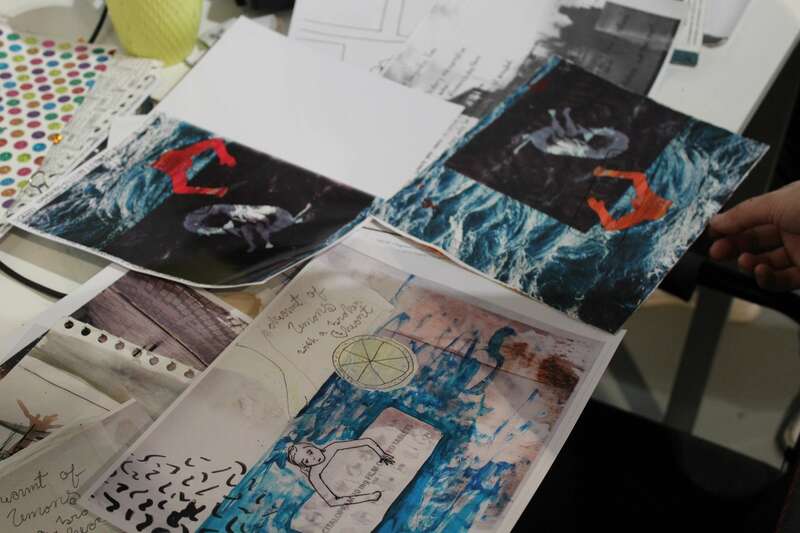 We talked about how she might begin to combine the various threads of her work and to be brave about doing so, thinking how conflict between works can be exciting. Rosie was thinking about what work to put into a show she had coming up, and how she might push some of the ideas she was already working on — using simple and readily available processes like photocopying — enlarging and distorting some of the collected and found imagery she already uses as her material. 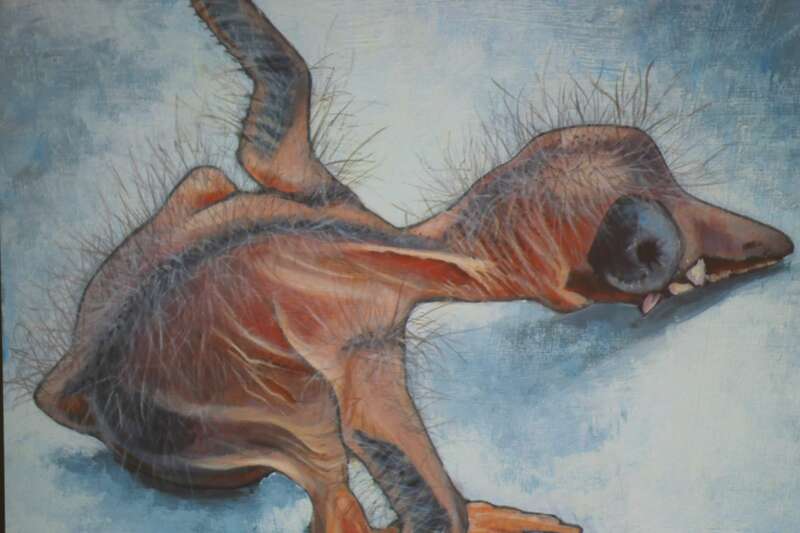 Next up, we spoke about Fernando Holguin’s painting practice. Fernando showed us a number of paintings, but particularly focused on a triptych of a jilted wife, lover, and husband. We had an interesting and measured discussion about gender roles, and thinking about the artist’s responsibility within these roles. We spoke about gender stereotypes, the way in which Fernando painted his characters, and whether to really conjure complex human relationships, we need to see conflict, contradiction and multi-layered emotions within a single picture. 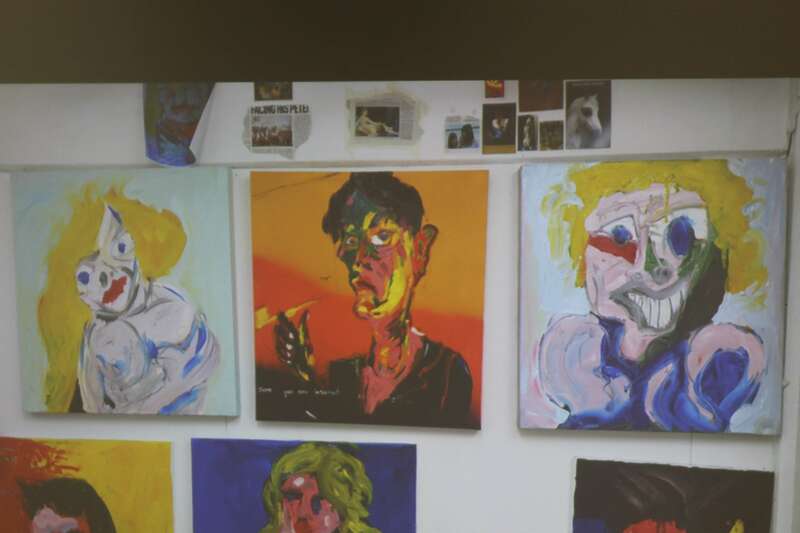 We also spoke about the dominance of masculinity in painterly art history and suggested new avenues for Fernando to pursue — spending time looking at artists such as Nicole Eisenman or Lynette Yiadom-Boakye. This conversation felt really useful to everyone involved and dealt with a lot of difficult subjects in a really productive way. We moved onto Julie Beresford’s work, Julie is a painter who hasn’t come from a formal art education but who is in the process of looking at painting BA’s and considering applying for one. Julie showed us a number of paintings and spoke incredibly fluently about the process with which she comes to deciding on a composition. One painting in particular was of a dead fox, and alongside it was a spade, what appeared to be roses, and a packet of mini cheddars. The roses turned out to be painted from images of discarded clementine peels. The fox, along with the spade and peels were all observations she had made over the years on route to taking her children to school. This incidental information made sense with Julie’s work. It had a quality that reminded the group of early Hockney, having a sensibility of magic in the everyday. Observation and magic felt key to this work, and we spoke about the levels to which elements of the painting could be left, and not overworked. We thought about how when you give just enough information it can be more rewarding to the viewer, and won’t fundamentally alter the intention of the work. 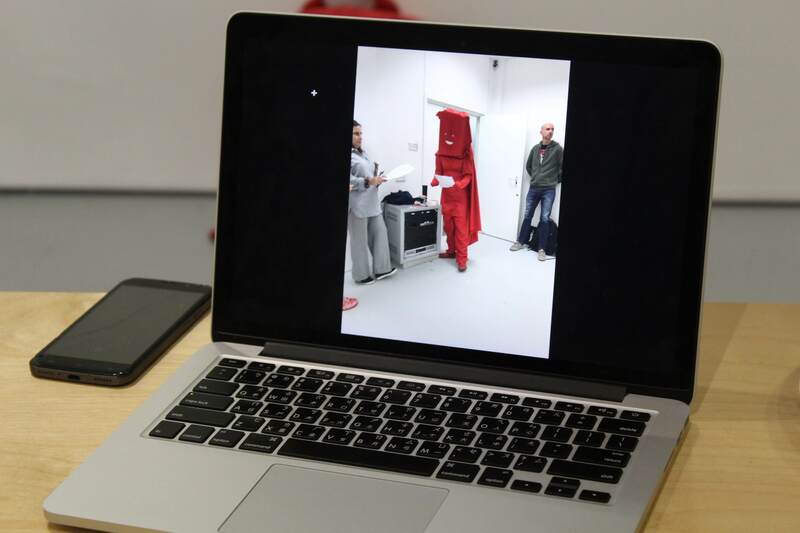 Corrine Chan is currently studying for her BA at Goldsmiths, she showed us footage of performance works she had recently done where she created a red suited, almost superhero character who remains mute throughout the performance. The character, Red, does interact with the viewers but, in an almost slapstick manner, will not be swayed from their muteness or their task of collecting the register of the Goldsmiths class. We spoke about comedy, stand up comedy as something Corrine could think about researching. She had been writing a script of the performance, after the fact with made up or exaggerated moments, which we felt was an interesting and comedicaly provocative aspect to the work. Agata Nowak makes work in an excited and necessary manner. She has young children and so has found methods of working that she can facilitate at home, on her kitchen table, using materials found easily to hand. She is interested in portraiture, character, human interactions. 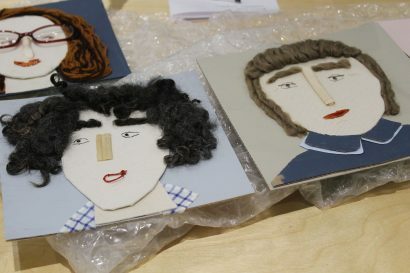 Her portraits were hand stitched onto a backing of pampers nappy packaging boxes — the group found this re-use of a material intimate and interesting to the work and we spoke about how Agata might think about that more as a component of her work to be confident in and to show more. We also spoke about other ways that Agata could develop her practice, through working with clay, still possible at the kitchen table. Agata has a kiln in her garage at home so we felt this would be an excellent way for her to try a new material but still maintain the same level of direct control. We spoke about artists Phyllida Barlow, a mother and former teacher and how an artist maintains their practice through motherhood and life responsibilities. We also looked at the work of Sheila Hicks and Rose Wylie. 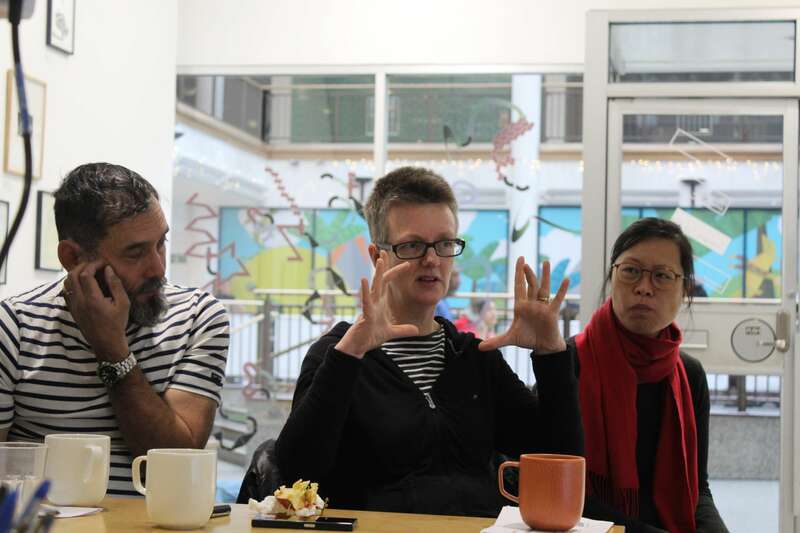 Many thanks to Kira Freije for leading the crit and for this writeup! Turf’s next free feedback session will be on the 26th of January, followed by Groundwerk 4.4: Performing the Archive, both led by ‘Croydon Plays Itself’ exhibiting artist Harold Offeh.